The luncheon is the North Metro Chapter’s flagship fundraising event of the year. It serves as the culmination ceremony for the class of 2019 and is a great way to honor and showcase their mentees and their accomplishments in the “Men of Tomorrow” mentoring program. 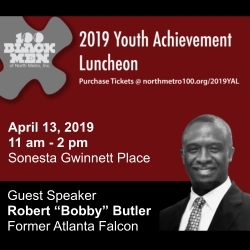 Atlanta, GA, April 04, 2019 --(PR.com)-- On April 13, 2019, the 100 Black Men of North Metro, Inc., a local Chapter of the 100 Black Men of America will hold their annual Youth Achievement Luncheon in recognition of our North Metro Mentees and community leaders. The luncheon will be held at the Sonesta Gwinnett Place Atlanta, 1775 Pleasant Hill Road, Duluth, GA 30096, from 11:00 a.m. to 2:00 p.m. Tickets are $60.00 per person and can be purchased online at www.northmetro100.org/2019YAL. Over 400 students, families, sponsors, and supporters are expected to participate this year. The luncheon is the North Metro Chapter’s flagship fundraising event. It serves as the culmination ceremony for the class of 2019 and includes scholarship distributions. It is also the venue for recognition of scholars who have excelled in the “Men of Tomorrow” mentoring program in the areas of leadership, academic performance and special recognition. The Keynote Speaker for this year's luncheon is former Atlanta Falcons legend Robert “Bobby” Butler. Bobby was a first round draft pick in 1981 by the Atlanta Falcons, where he played 12 years in the NFL, all for the Falcons, earning the reputation of one of the top defensive backs in the league. In 2015, in recognition of the Atlanta Falcons franchise’s 50th anniversary season, Bobby was recognized as one of the top 50 players in Atlanta Falcons history. About 100 Black Men of North Metro, Inc.
100 Black Men of North Metro, Inc. has been serving the Metro Atlanta area since 1992 and is a coalition of some of the Atlanta area’s most prominent citizens. Our mission is to provide support and improve the quality of life for African Americans, particularly African American youth in the Cobb, Gwinnett, and North Fulton County communities. The 100 is one of the city’s strongest and most self-reliant African American volunteer organizations. Our Four for the Future programs are the strategic areas of focus that support the mission of the organization. Subject areas encompass Mentoring, Economic Empowerment, Education and Health & Wellness. Building trust among young Black men with examples of positive relationships is the 100’s focus as it delivers programs for African American youth. Directly mentoring over 150 youths every month through our education and mentoring programs, the North Metro Chapter continues to be a beacon of leadership for the community. For more information, please visit our website at www.northmetro100.org. On April 13, 2019, the 100 Black Men of North Metro will hold their Annual Youth Achievement Luncheon in recognition of North Metro Mentees and community leaders. Click here to view the list of recent Press Releases from 100 Black Men of North Metro, Inc.